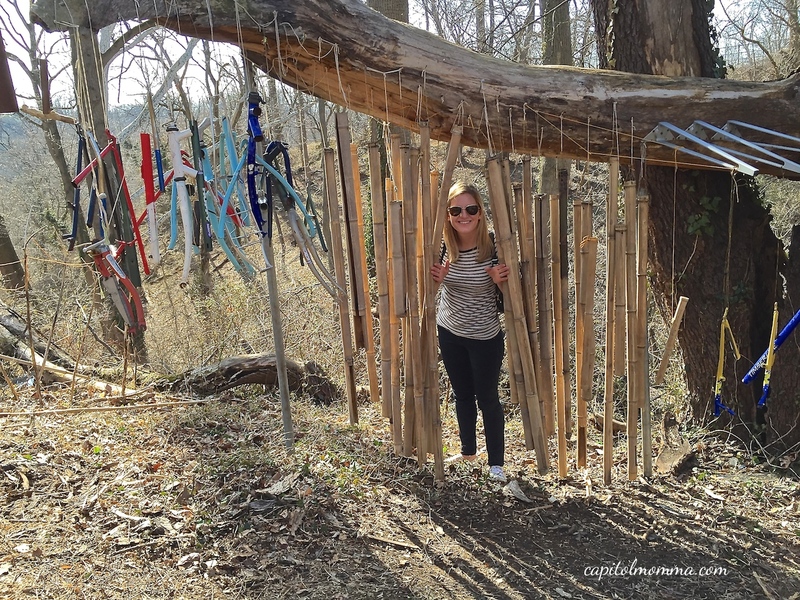 After reading about a secret glass forest on Kid Friendly DC and Thrillest , I was really curious and wanted to check it out. We pulled into the small parking lot at the Palisades Recreation Center and my girls immediately saw the playground so we went there first. It is a really nice, gated playground with the rubber surface and it also has water features in the warmer months. 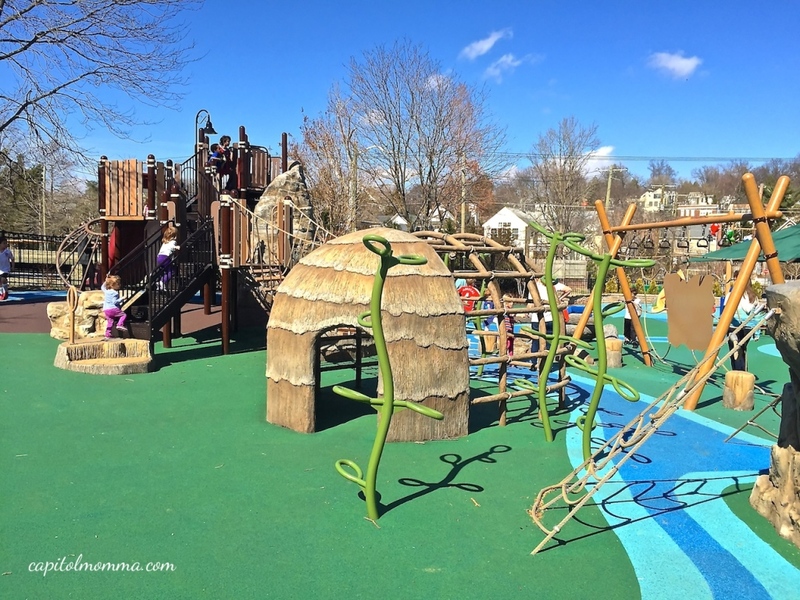 The playground is best suited for ages 2-5. 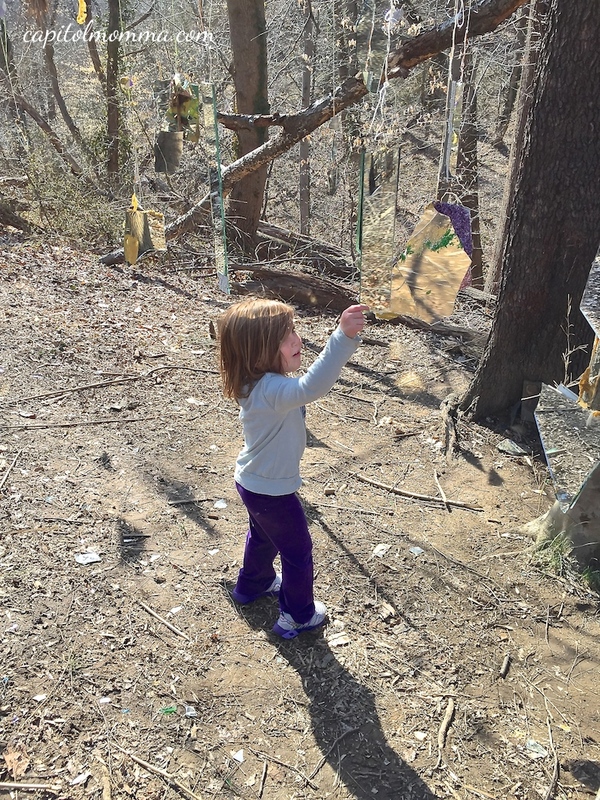 After playing for about an hour, I told the girls we were going on a hike through the secret glass forest and they were excited for the adventure. I wasn’t sure exactly where it was, since there are no signs anywhere. A description I read online said that the trail basically starts behind the backyards of nearby homes, so we headed in that direction. I saw picnic tables and decided to keep going. Then we came upon big bunches of leaves tied together and hanging down from a tree branch and beyond that I saw some pieces of mirrors, so I figured we were on the right trail. Scattered throughout the forest are at least 10 or so different sculptures made from natural materials, scrap metal, plastic pieces, old parts, mirrors, and glass. It is really pretty strange and almost creepy. Like the Thrillest article mentions, it does have a sort of Blair Witch vibe. There is even a chair like piece with some sort of animal fur thrown over it…very, very odd! However, Clara had fun discovering new surprises as we walked along. And little Mae was happy picking wildflowers. Parents should know that it isn’t the safest place to take kids. 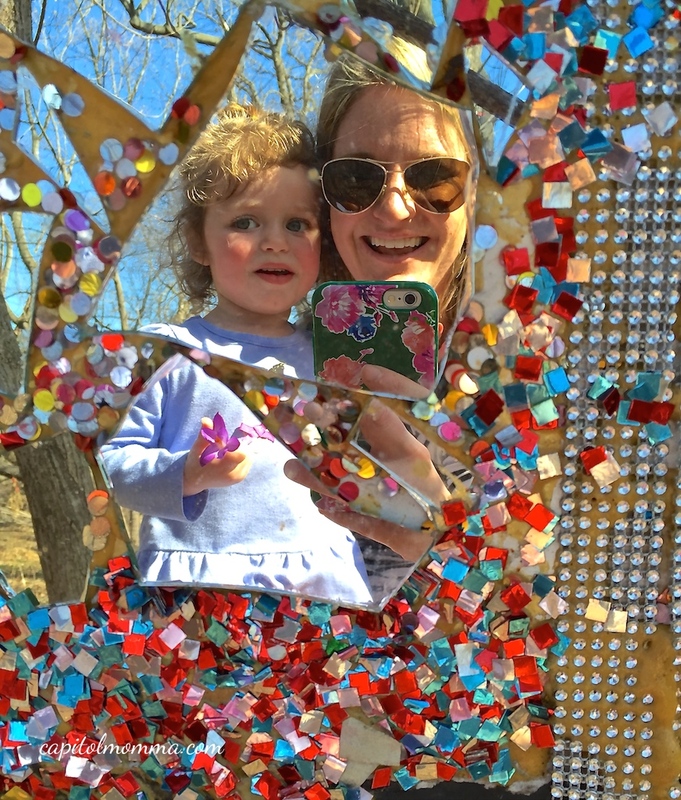 There are broken glass and mirror pieces all over the ground, so you have to really watch little ones. I wouldn’t consider this as a “must see” but it is interesting for sure! The playground is great, so if you are already there its worth taking a little walk into the woods. Kids First Swim School North Bethesda + Giveaway! 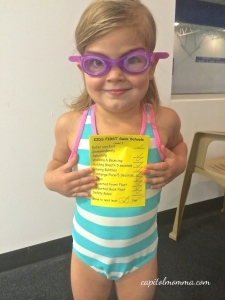 Clara first started lessons at the Kids First location in Rockville last June and then switched over to the new North Bethesda location once they opened in August. Before participating in lessons, Clara did not even like putting her face in the water and she always needed to wear her puddle jumper to feel comfortable in the water. Now, just seven months later she has moved up from level 1 to level 3. She is now holding her breath underwater for more than 10 seconds, is doing front and back floats, bobs with rhythmic breathing, jumping into deep water, retrieving objects in chest deep water and working on sitting dives. I’ve been amazed! I honestly didn’t think she would make so much progress this quickly! 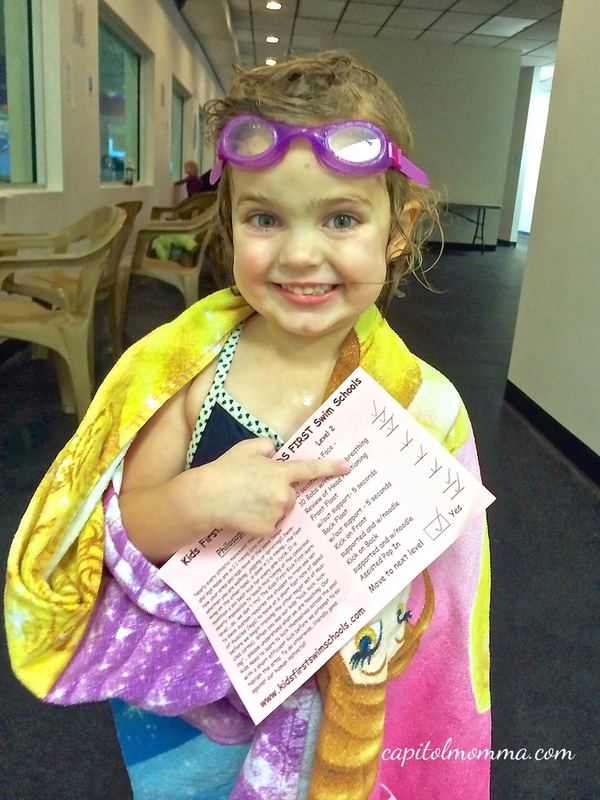 I must give credit to all the amazing instructors we’ve had a Kids First who have made Clara feel so comfortable and have motivated her to work hard on her swimming skills. The facility itself is meticulously clean as well as the pool which is maintained at 90 degrees, providing a perfect environment to learn in. No shivering kiddos at Kids First! Clara still gets excited to go to lessons every week. 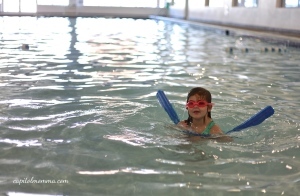 The instructors do a great job of making the lessons fun for the little ones. There are no more than five children in the small group lessons, so each child receives plenty of attention during the 30 minutes of instruction. 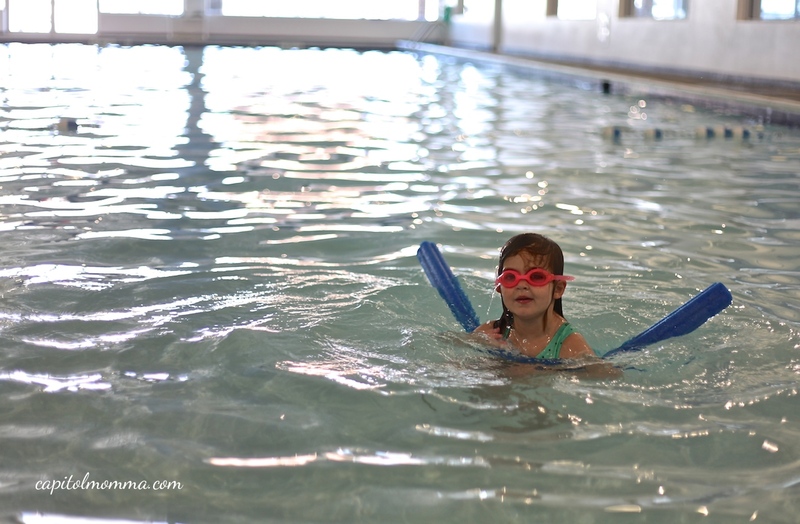 There are also family swim sessions held on Saturday and Sunday evenings for extra practice and play time in the water. Session 3 is starting next week and runs for six weeks from March 23rd through May 3rd. Kids First North Bethesda has generously offered to give away a $100 gift certificate to one lucky Capitol Momma reader! 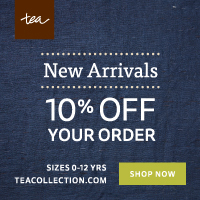 The gift certificate can be used towards lessons or a birthday party. The giveaway is open now through Sunday, March 22nd. The winner will be announced Monday, March 23rd – just in time for the next session! If you haven’t taken your children to an Encore Stage & Studio production yet, you should add it to your entertainment must-do list! The Three Musketeers was the second Encore show my daughter Clara and I have had the pleasure of watching. 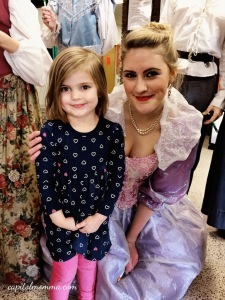 What I love about Encore’s productions is that the actors are all children. It seems to really capture my daughter’s attention to watch other children perform on stage. 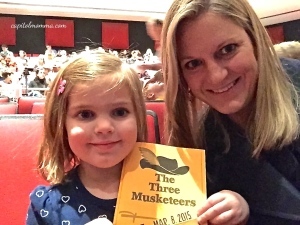 In The Three Musketeers ensemble there were over 25 talented young actors. The story was fun and entertaining with a twist on the classic Alexandre Dumas adventure: In 17th century France, a poor young nobleman named D’Artagnan leaves home to join the famous Musketeers of the Guard – defenders of the King and masters of the rapier! On his journey, D’Artagnan befriends three famous Musketeers: Athos, Porthos, and Aramis. As the foursome roams the countryside, they encounter a dastardly plot to kidnap the King’s favorite dog…and realize they’ll need the help of three swashbuckling ladies to save the day. The script included plenty of humor that had both my daughter and I laughing throughout the show. The stage set and costumes were creative and well done. Some of our favorite parts of the show were the sword fighting scenes and the toy poodle, Piper! He definitely thrilled the audience! Clara was particularly fond of Milady de Winter so she was super excited to pose for a photo with her after the performance! We are looking forward to attending Encore’s upcoming performances this summer: Alice in Wonderland, June 5-14 and Shrek, July 17-26. •Ticket prices: $12 adults ($15 for Shrek), $10 children, students, seniors, and military ($12 for Shrek). •The shows last approximately 1 hour and 30 minutes with a 15 minute intermission. •Concessions can be purchased and enjoyed in the lobby before the show and during intermission. •There is free and ample parking at the Thomas Jefferson Community Theatre, where all Encore productions are located. •Encore offers a birthday party package. •Encore also offers a variety of classes and camps.